Last Christmas, I gave you my… holiday wish list. Sadly, I received not a single one of the items on that list. Perhaps I need to marry into a wealthy family, or maybe if my parents or one of my siblings wins the Power Ball lotto someday. But if one of you out there just won the lotto and desperately need to make a wish come true, the list is still good for the most part. To refresh your recollection, most of those items would still be the greatest gift ever: (1) A Norton Commando — not a new one, but a classic, 70's, legit British street fighter. (2) A new engine for my Sportster. This I no longer need, as I gave the bike to my youngest sibling, and I'm now riding a Dyna Wide Glide. (3) My old black cafe-style motorcycle jacket that was stolen at a bar in Pittsburgh last year. (4) MP3 sunglasses. I don't recommend riding while listening to music, but I would be lying if I said that I didn't love it. What's better than zipping around while listening to the Boss, or Kenny Chesney, or whatever it is that makes you want to sing? But yeah, as your favorite preacher of motorcycle safety, I don't recommend this, especially when riding around town or in traffic. Ok, with jokes aside, let me make a few recommendations for those of you who have loved-ones who ride (or want to start riding) motorcycles. First and foremost, how about signing them up (and paying for) a motorcycle safety course with the Motorcycle Safety Foundation! The classes are fun, very instructive, will lower their insurance rates, and best of all, could save their life! They even offer advanced riding courses. Another good gift idea is a new motorcycle helmet. Most of us don't get new helmets often enough — I will admit that mine is pushing the ripe old age of eight years old. A lot of manufacturers recommend going new every two. I think that might just be because they want to sell more, but I definitely believe that replacing your helmet at least every five years is a good idea. I know, I know, I just admitted that mine is ancient. But as my parents used to tell me, do as I say, not as I do. Make sure that wherever you get the helmet they have a decent return/exchange policy, because proper fitment is vital. New footwear, i.e., motorcycle boots, can make a great gift too. I don't know too many riders who don't love a great pair of motorcycle boots. Again, I would caution you to make sure that wherever you buy them, they will exchange the boots if they don't fit properly. You don't want to spend that kind of dough on something that is going to give your favorite guy or gal blisters! From the motorcycle accident lawyers at Riderz Law, here’s hoping you all get what you want this Christmas. Really, if you are lucky enough to spend the holiday with loved ones, what more could you ask for? 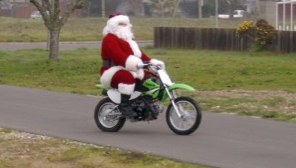 Merry Christmas, and please ride safe this holiday season. And hey, if you got a great motorcycle-related gift this year, tell us about it!